This recipe will explain how to convert your purchased DVDs to the .m4v format which in turn we will import into iTunes to sync to our iPad. There are several ways to do this, I will show you the process that I use which does use one commercial app for ripping, DVDFab. We’ll break this guide into 3 sections: ripping dvds to pc, convert ripped dvd to ipad format, importing back into itunes/adding ‘flair’ (ie album art, info, sorting). 1. Open up DVDFab and insert your DVD. DVDFab will scan the disc and it may take a few minutes to finish scanning. 2. Once it finishes, you will see a list of titles, by default DVDFab should selection the main title, however sometimes you do have to choose it yourself (depending on what tab your on, i use Customize and change my settings to do movie only). Select your Audio streams and Subtitle/Caption options on the right. You can preview the Title by using the lower left preview window, right-click on the video to choose which audio and subtitle streams to preview also. Once your set, click Next. On this screen, Click on the Remove Menus option and also choose if you want to do DVD9 (dual layer), original quality or convert it down DVD5 (single layer) DVD (in the drop-down by the back and start buttons). 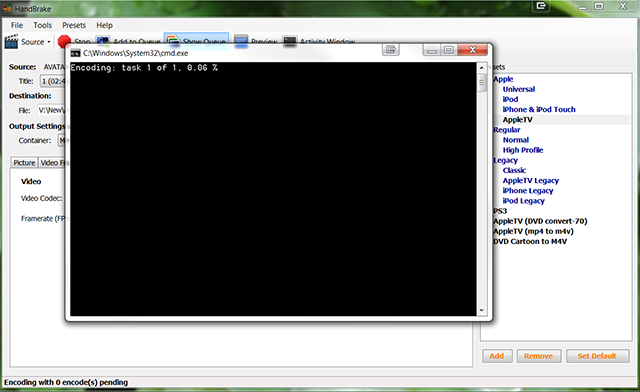 I would recommend DVD9 since its better to start with a higher quality source when converting in handbrake. And then click Start. It will rip the DVD, this usually takes about 10-15 minutes depending on movie and your system, etc. 2. 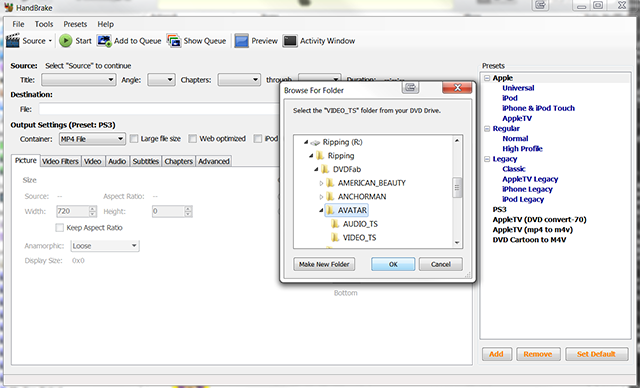 Browse to where we saved our ripped DVD to and click on it and OK. (my example, R:\Ripping\DVDFab\ ). 3. Handbrake will scan the folder for a few seconds. Once its done, use the AppleTV preset on the right side. 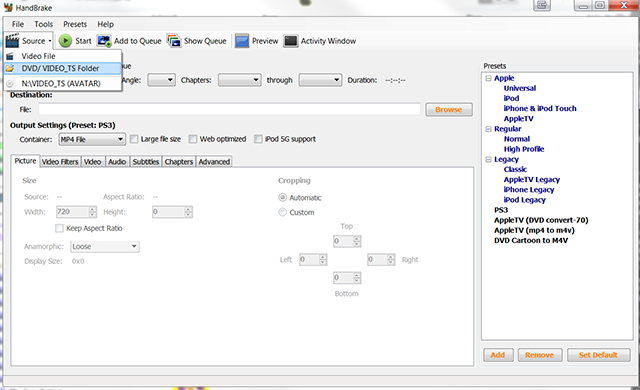 Click on it and it will change the settings in Handbrake to match the AppleTV requirements. AppleTV and the iPad are very similar in terms of what video formats they take. You can now also change the Quality to your liking. By default it is set around 65%, I personally change it to about 50% to get nice files sizes (about 1gb for 1hour, ie 2 hour movie = 2g). Also, you can add languages and subtitles by click on the tabs and setting the options Once your set, click on Start button to start converting right away or use the Add to Queue to convert later or in batches. This will take a few hours or so depending on your system. I usually setup a queue of movies to do at night right before I go to bed. 2. iTunes will now copy this files into your iTunes library. Once its done copying, go to Movies and right-click on the movie and choose Get Info. 3. You can now add album artwork via the artwork tab, info about the movie in the Info tab, sorting options, and change options so that it shows in the TV Shows or as a Music Video (via Options tab).